Archivists mine the collections and materials they process for key points of access, as gateways to gain attention and connect researchers to archival resources. Keeping in mind the needs of both the current and future generations of researchers, locations, names, dates, specific activities and events, along with other keywords get logged in the mind’s eye of processors whilst looking to make sense of the surviving records under their care. Terms like these provide valuable clues and points of entry into the materials to unearth important pathways for discovering existing relationships. Recently, while reviewing the rows of boxes of New York Zoological Society press releases that survive at the WCS Archives, an unexpected path presented itself in the official press release for the promotion of Dr. Raymond Deiter to Assistant Veterinarian for the Society in the mid-1970s. A reference to a summer whale-collecting expedition in Hudson Bay, Canada, revealed a glimpse into the lesser known history of conservation partnerships between local communities and the Society, including indigenous, First Nations, Métis, Inuit, and traditional communities. Further exploration accompanying handwritten research notes for the announcement of Dr. Deiter’s promotion included raw references to the expedition and the international participants of the team involved. The general names and terms referenced for the participating members included two members from the Mystic Aquarium (Connecticut), two “females” from the Vancouver Aquarium (British Columbia, Canada) and six “native Indians” to acquire belugas in Churchill, Manitoba for captive breeding purposes at the New York Aquarium. The use of labels such as “female,” “native”, or “Indian,” rather than the names of the people or indigenous communities to which those labels refer, is reflective of the time period, but, in spite of their broadness, they still provide subtle and useful signposts to navigate related collection materials. 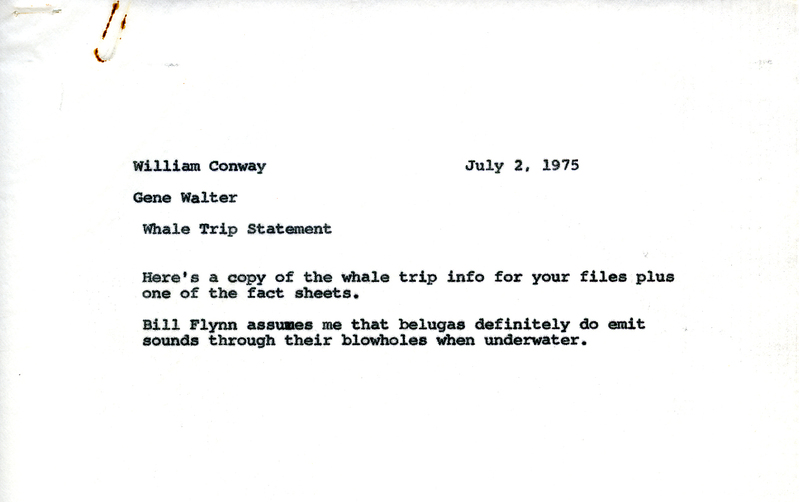 Memo from General Director William Conway to the Editor and Curator of the Department of Exhibition & Graphic Arts Gene (Eugene) Walter, regarding anticipation of the upcoming whale expedition, 1975. Scanned from WCS Archives Collection 2032. The summer season in Hudson Bay and nearby Churchill, Manitoba is a key location on the annual migration path for belugas (qilalugaq in Inuktitut, a language of the Inuit), white whales or “canaries of the sea” (as referred to in Society fact sheets for a 1975 expedition). Churchill and the Churchill River are in close proximity to the Manitoba/Nunavut border in Canada, which suggests the possibility of partnerships with First Nations, Métis and Inuit indigenous communities at that time. Exploring related subject and events files within NYZS Public Affairs collection, one of the collections currently part of WCS Archives’ processing project, records from a subject file loosely titled “Whale Trip 1975” show a John Hicks as the “leader of the Indian capture team” during the summer whale collecting trip in Churchill, Manitoba. Following Hicks into records and personal papers of the former Director of the New York Aquarium (NYA) and the Osborn Laboratories of Marine Sciences (OLMS), George D. Ruggieri, we find a “Mr. John Hicks of Nanuk Enterprises Ltd” appearing in files relating to a subsequent whale collecting trip in 1984 in the same region. Amongst Society memoranda, expedition reports, and planning notes, his role as co-supervisor of collecting activities is revealed within the correspondence between the National Marine Fisheries Service of the U.S. Department of Commerce, and the New York Aquarium. The details of the responsibilities of Mr. Hicks and the company in this endeavour are included and attributed in these files. 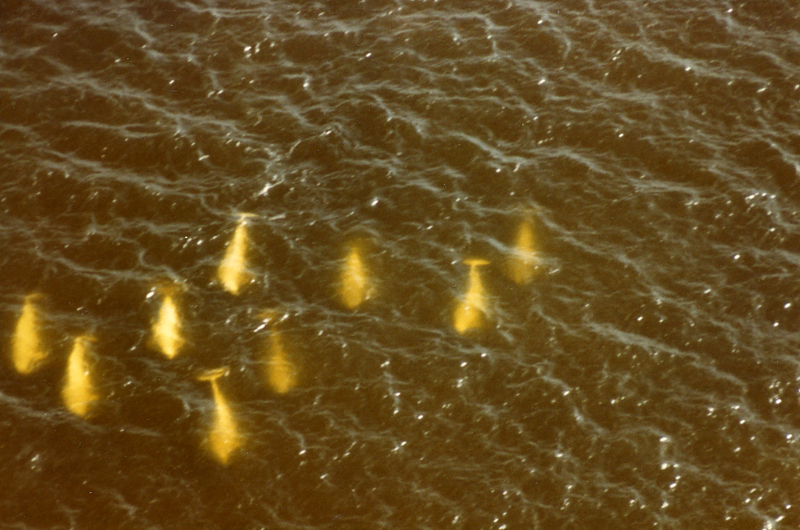 Photograph accompanying 1984 whale expedition records showing an aerial view of a beluga whale pod, circa 1984. Photograph by Jerome Hamlin. Scanned from WCS Archives Collection 3008. 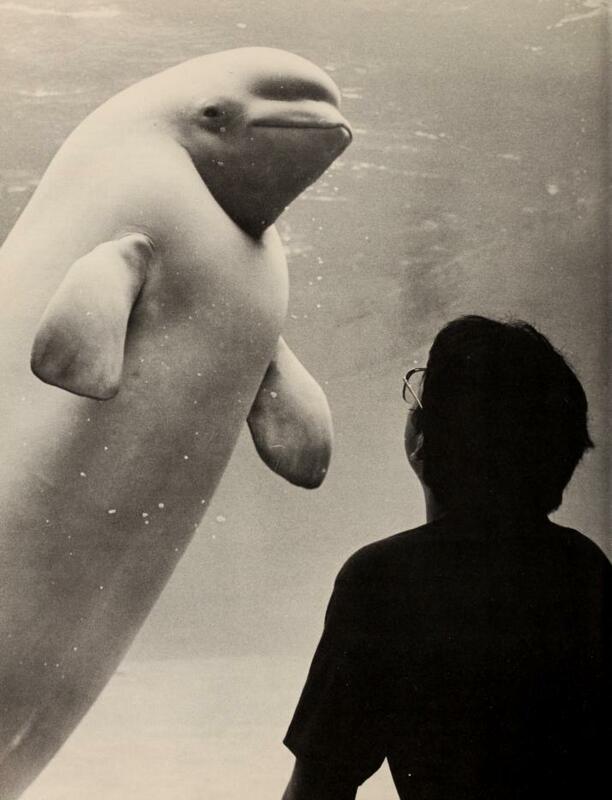 Kathy and Newfy—and later Natasha and Winston from Churchill, Manitoba—joined the New York Aquarium beluga group for its intended captive breeding program in 1975 and 1984 respectively, according to NYA and OLMS press releases, newspaper articles and NYZS annual reports of the time. The program was indeed successful; however, it was discontinued in later years, and whales are no longer exhibited at NYA. 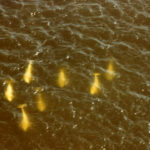 Image illustrating an article introducing the new arrival of beluga whales at the New York Aquarium, circa 1984-1985. Screenshot from the New York Zoological Society Annual Report 1984-1985. Following a trail of keyword terms through subtle references of identifying names, locations, and subject areas, it is possible to witness how even general search terms can uncover records that can provide insight into historical partnerships between NYZS and indigenous communities. 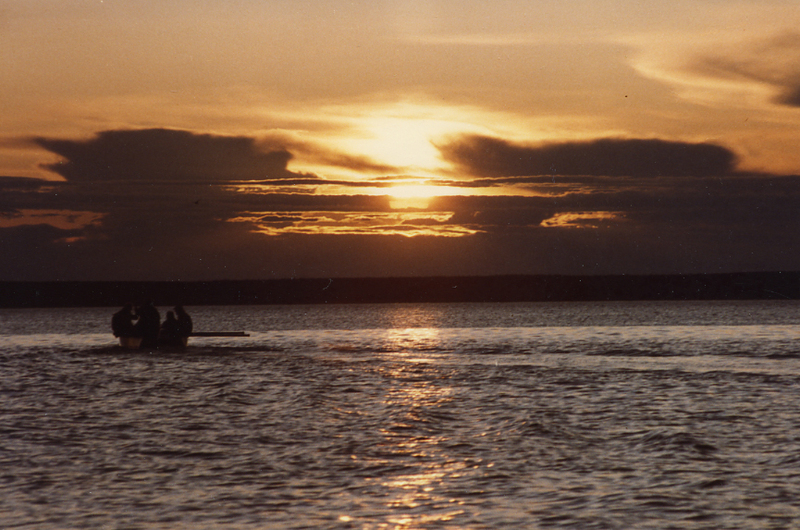 Photograph accompanying 1984 whale expedition records, circa 1984. Photograph by Jerome Hamlin. Scanned from WCS Archives Collection 3008. Today, indigenous organizations such as the Inuit Circumpolar Council (ICC), Inuvialuit Joint Secretariat make up a long list of WCS conservation partners in its mission to save wildlife and wild places worldwide.